I was tagged. Not in the spray paint graffiti sense, but in the easier to read meme sense. This one involves self promotion that will lead to being pimped by others I tag. At least, I THINK that’s how this is supposed to work. What is the title of your upcoming release? A Basic Renovation. What genre does your book fall under? I write contemporary romantic comedies. Will your book be self-published or represented by an agency? My first book, A Basic Renovation, is being released by Escape Publishing in February. How long did it take you to write the first draft of your manuscript? About a year. A Basic Renovation was written as part of my Masters thesis and probably would have take me less time to write if I didn’t have to write the thesis. What other books would you compare this story to within your genre? I like to *think* I’m a mix of old Susan Donovan and Rachel Gibson rom-coms, with Elmore Leonard, James Thurber, and a few screenplays by Preston Sturges and the Coen Brothers tossed in. Yes, I hear you all laughing. The setting of the novel, Los Alamos, NM, was hit by a massive bush fire (or wildfire) in 2000. Over 400 hundred homes were destroyed. There was one street where the fire blasted through and wiped out every house–except ONE. The owner put a sign at the end of his driveway. The sign said, “Last One Standing.” That house and sign stuck with me for a few years until I realised I had a story idea. Also, the story contains red cowboy boots. I’ve always wanted red cowboy boots. What else about your book might pique the reader’s interest? The lead characters are over forty. And they DO IT. They do it like you, your parents and grandparents do it. Did you know your grandparents DO IT–and I bet they LIKE doing it. Where did the idea come from? 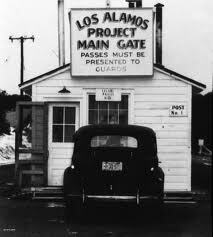 It’s the second book in a series that takes place in Los Alamos. There’s a nuclear research Lab in Los Alamos, which was founded in 1943 and became home of The Manhattan Project, the birthplace of Fatman and Little Boy–the first two nuclear bombs ever constructed. In the years since WWII, there have been a number of instances where classified information was mishandled or stolen from the Los Alamos National Lab. I based And She Was on one rather odd event. Which actors would you choose to play your characters in a movie? Oh geeze. um, for A Basic Renovation, I’d go with Clive Owen–he’s got the presence–and Holly Hunter–she’s got the stature and balls. For And She Was it’s Eureka’s Colin Ferguson–I like how he fills out a police uniform–and Janeane Garofalo (with white hair)–she’d pull of the comedic and emotional scenes with equal brilliance. Enjoy what Nicky‘s got up her sleeve and I’ll get out and rustle up some meme victims I can pass this on to. I am so looking forward to reading your book. Yes, you may be luring me away from the paranormal. I do love me a good comedic touch and besides, red cowboy boots! I am humbled, Lisa. Thank you. OMG! It feels so good and so exciting to read about A Basic Renovation’s release. I can’t wait to buy this most awesome book. Can’t wait to buy And She Was too. I know it’s brilliant! Sandra, with your tremendous characters leaping off the page and absorbing narrative, I just want to roll on to February. Talking Heads gave me the title for book 2, because heroine *was* all these things.. Thanks for the good wishes. They mean a lot coming from you! Didn’t realise your release was so soon! Best of luck with it!